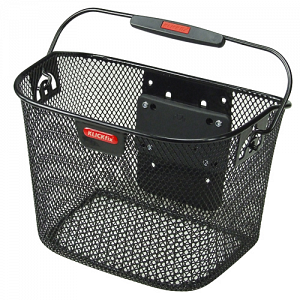 The smallest version of the meshed handlebar basket. Coated surface. With handle and special adapter plate for adjustable height. Fits into KLICKfix handlebar adapter. Also perfect for kids' bikes. If the distance to your back wheel is large enough, you can use the small Shopper with Extender on the seatpost (max. 5Kg). The Mini basket is ideal in combination with our little BaB's Basket Bags. Please take maximum load of the chosen adapter into account! You can mount the adapter plate at different heights to leave enough space for your light.